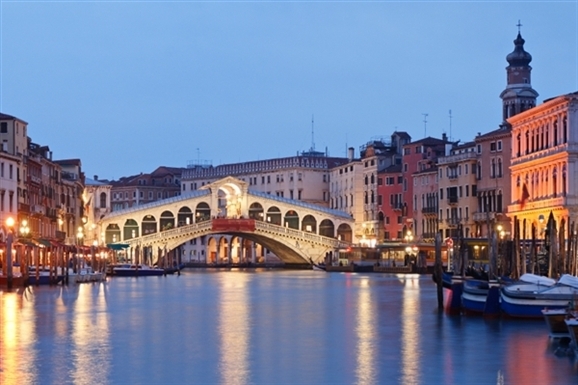 The hardest part of visiting Venice is….visiting Venice. In any other place I will willingly bump elbows with throngs of camera-toting tourists in order to stand before a master-piece of art or architecture. Yet, despite Venice’s magnificent cultural endowment, I find it extremely difficult to leave my hotel room. Venetian hospitality can be so exquisitely sumptuous that it turns this intrepid traveler into a happy agoraphobic. There is no more luxurious cocoon than a suite at the Gritti Palace, the 15th century palazzo overlooking the Grand Canal that has served as temporary home to luminaries from Hemingway to Hathaway. Each room is a treasure trove of antiques and frescoes, and while some rooms may be better than others, I suppose, such distinctions are as futile as choosing your favorite Canaletto. The Gritti is as warm and intoxicating as a balsamic Martini served by the hotel’s charming barman; like the cocktail it can’t be adequately imagined until experienced and can’t be experienced only once. It is guilt more than anything that compelled me to venture further afield than the Gritti’s front salon. I was an Art History major (longer ago than I am willing to admit) and it would be a mighty insult to Venice, not to mention my patient professors and always supportive parents, if I did not give some meaningful attention to the city’s wonderful galleria, museums and churches; each as important to Venice’s identity as the canals themselves. It was the fortunate product of lucky timing that my most recent visit to Venice occurred during the Biennale, the Grand Dame of contemporary art exhibitions. The Venice Biennale is to art exhibitions as Cannes is to film festivals and Wimbledon is to tennis tournaments; there are others but, no matter how modern and grand, they are still just imitations of the original. Much like the Gritti Palace, I suppose. The Biennale provides a curious juxtaposition as it presents an exposition of the world’s most cutting-edge contemporary art in one city, more than any other, which has most skillfully rebuffed the homogeneity of technology and globalization. Venice and its Biennale are uniquely and delightfully alone in form and substance. That said, the city and the exhibition have worked diligently to remain relevant to modern society without sacrificing their defining characteristics. Again, much like the Gritti Palace. The Biennale with its 29 national pavilions and 200,000 visitors has miraculously avoided becoming an ugly carbuncle of commercialism. Yes, it is glamorous and clamorous, expensive to operate and reliant on national and corporate sponsorship; Burning Man, it isn’t. However, to its enormous credit, the Biennale provides a showcase for art and artists that might not otherwise get mass exposure…even if Tino Seghal, this year’s winner of the best-in-show Golden Lion award, is seemingly hostile to mass dissemination of his art. Seghal, a Berlin-based performance artist, offers his patrons a unique performance that cannot be photographed or recorded for sound or image. The artist has a keen sense for the contractual and stipulates how, when and for what price each performance can be presented. Is this pretentious twaddle and open mockery? Or is this a fascinating means of ensuring that his audience has a unique and timeless experience? Indeed, if it is the latter Venice might be the perfect place to exhibit such a performance. After all, Venice is timeless, unique and cannot be replicated. Artist and art patron Jane Irwin explained. “Art has transformative powers that you see in Venice more than in any museum, dealer or show. It has the magic mix of curated academic show and anything goes party”. In keeping with Venice’s lavish history, the Biennale is a cultural phenomenon that provides a glorious justification for decadent celebration. Again, the juxtaposition of celebrating that which is most contemporary in the city that is least contemporary is integral to the success of the exhibition. Contemporary art is not a medium that should be taken casually, otherwise its lack of traditional conformity will be reduced to trite assessment and dismissive misunderstanding. I will fully admit that I cannot describe, let alone explain, much of what was displayed. However, I can tell you that the experience was both challenging and invigorating; though not as comforting as finally meeting a master-piece from my college textbook. At the end of the day, however, I had the reward of a Bellini on the Gritti’s terrace to remind me that today’s contemporary is tomorrow’s antiquity. Yikes, that might be true of me too!…. No, that’s ridiculous; clearly an analogy run amok. Great blog! Makes me want to go to Italy. Life is good. Miss Beijing and jack. He seems to be enjoying his new adventure Hunter busy applying to universities and John traveling a ton! Zhuangzhuang and I walking a lot. Wish you and marley could join us! Thank you. So lad you enjoyed it!